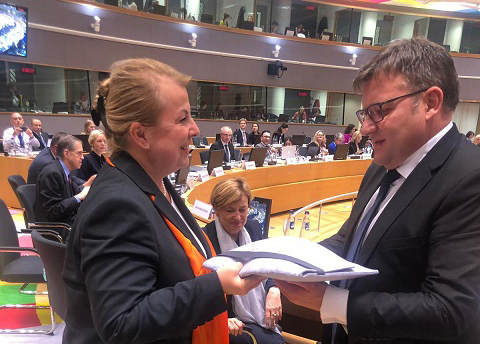 Today, in Brussels, Minister of Labour and Social Justice, Marius Budăi, took over symbolically the Presidency of the Employment, Social Policy, Health and Consumer Affairs Council (EPSCO), in the context in which Romania will hold, from the 1st of January 2019, the Presidency of the Council of the European Union. Marius Budăi presented to the other Labour Ministers of the EU Member States the priorities of Romania in the field of labour and social affairs during the Presidency of the Council of the European Union: labour mobility, health and safety at the workplace in the context of the new forms of employment and, not least, reducing the pay gap between women and men, in terms of gender equality. “The Romanian Presidency will focus on sustainable development and on reducing the development gaps between different regions and different socio‑economic categories, convergence and cohesion, employment and social rights, innovation and digitalisation, interconnectivity and competitiveness for a stronger Internal Market. As sectoral priorities for the employment and social field we aim during the PRES RO 2019 to promote labour mobility as key element in ensuring the balance of the labour market, preventing the risks and promoting safer and healthier working conditions, as well as increasing women’s economic independence by reducing the gender pay gap and encouraging women’s participation in the labour market”, stated Minister Marius Budăi to his counterparts of EPSCO. The Ministers of Labour of the Member States also agreed today the Council’s position (general approach) on establishing a European Labour Authority (ELA), which is intended to strengthen the cooperation between the labour market authorities of the EU Member States. Minister of Labour and Social Justice, Marius Budăi, also had bilateral meetings in Brussels with his counterparts from Austria – Beate Hartinger-Klein, Ireland – Regina Doherty, Germany – Hubertus Heil, Slovakia – Jan Richter and Sweden – Ylva Johansson. Also, Minister Marius Budăi had a brief meeting with Vera Jourova, European Commissioner for Justice, Consumers and Gender Equality.